Help your friends and loved ones favorite movie stars come to them, by giving them the gift of entertainment, AMC gift cards! 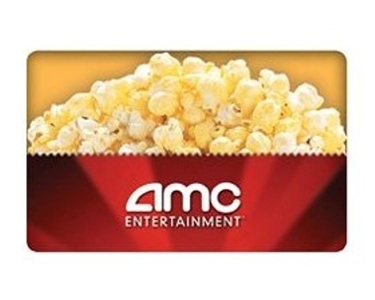 AMC gift cards are good for both movies and concessions and are re-loadable at any theater in the United States. 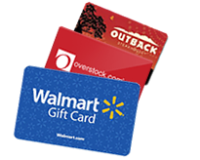 AMC gift cards do not have any associated fees or expiration dates so your gift spans the test of time. AMC, the first in the exhibition industry to offer personalized gift cards, was also the first in the industry to launch circuit-wide gift cards in 2002. We think that's pretty cool too. Headquartered in Kansas City, Mo., AMC Entertainment Inc. is a leading theatrical exhibition and entertainment company. With a history of industry leadership and innovation dating back to 1920, the company today serves hundreds of millions of guests annually through interests in 307 theaters with 4,612 screens in five countries. Gift Cards are redeemable at our AMC theatres in the US (including Loew's, Magic Johnson, Cineplex Odeon & Star). To protect your gift, this card will be shipped inactive. Please follow the activation instructions within your shipment to activate the card within 14 days of arrival. Legal Disclaimer: Gift Card Instructions 1. To make a purchase, present your gift card at any box office or concession register. 2. To obtain the current balance of your gift card, text AMC followed by the 19 digit account number to VALUE (82583). If you have questions about your gift card, please visit any AMC theater. Terms & Conditions Your use of this card constitutes acceptance of the following terms & conditions. The value stored on this card may be applied toward a purchase at any AMC theater, Loews theater, Cineplex Odeon theater, Magic Johnson theater and Star theater, in the U.S. This card can not be refunded or redeemed for cash (except in CA, MA, and WA or as required by law.) This card will not be replaced or replenished if it is lost, stolen, or used without permission except as required by law. It will be voided if altered or defaced. This card is transferable. Protect this card and treat it as you would cash. Issued by AMC Card Processing Services, Inc. Text messaging rates apply.